Give your car rich, liquid shine! 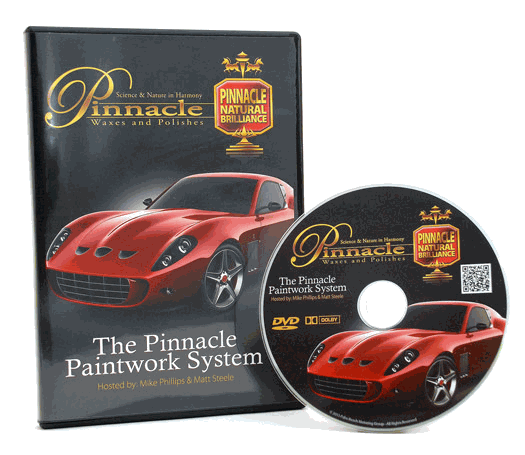 The Pinnacle Liquid Souverän™ Concours Wax Kit includes the best liquid car wax you can buy! Liquid Souverän™ Wax is packed with the most real carnauaba wax you can get in a liquid wax. This kit gives you the products to properly prep the paint for an amazing, 3-D shine that could only be Liquid Souverän™ Wax! Your car's finish is under assault! Regardless of how beautiful your car looks now, the finish will deteriorate and dull. Don't let pollution and acid rain destroy your car's good looks. Protect your investment with our Liquid Souveran™ Concours Kit. Pinnacle Liquid Souverän™ Wax is the only liquid carnauba wax to come close to the sizzling shine of Pinnacle Souverän™ Carnauba Paste Wax. With an amazing blend of carnauba and liquid crystalline polymers, Pinnacle Liquid Souverän™ Wax achieves the deep, wet gloss of a paste wax in a long-lasting, easy-to-apply, liquid formula. The polymers are added to enhance the brilliant shine, the protection, and the durability of Liquid Souverän™ Wax. As you wash, natural coconut oils attach to surface dirt. These oils act as a lubricant. Sand and abrasive grit slide off in the rinse water without scratching the surface. The oils wet the paint to create a beautiful luster, even before you apply wax! Bodywork Shampoo will not remove protective coatings. Applied prior to waxing, Paintwork Cleansing Lotion uses a combination of gloss-enhancing oils and fillers to polish without abrasives. It removes old wax and oxidation while filling in minor imperfections. When wax is applied, it reveals nothing but perfect paint. Natural carnauba wax gives Crystal Mist Carnauba Detail Spray its distinctive, wet-looking shine. Carnauba, combined with crystalline polymers, creates sharp reflections and silky paint. This state-of-the-art carnauba-polymer matrix also enables Crystal Mist to bond to the existing wax for an instant but long-lasting gloss. On top of Liquid Souveran™ Wax, Crystal Mist reactivates the existing wax so you’re not just seeing a surface gloss  you’re seeing the depth and dimension of multiple layers of carnauba. Microfiber Applicator Pads are great for applying pre-wax cleaners, polish, dash and tire dressings. These super-soft pads are completely clear coat safe and will never cause swirls. A total retail value of $146.91. SAVE $46.92! Very good quality product. Amazing results. Very satisfied with my purchase. ConsA little pricey but I get it: you get what you pay for. Still, worth every penny.